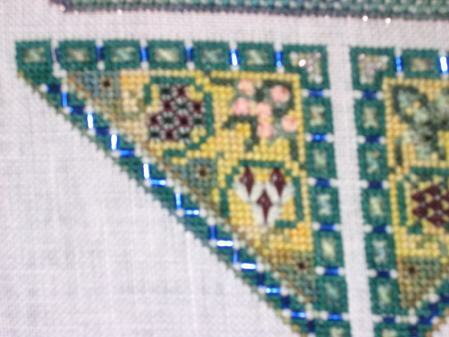 On Friday, I finished one of the two triangles in this month’s installment of Chatelaine Mystery 9. I really liked the satin stitched flowers, but I agree that the red ones on the bottom were a bit weird to stitch. I should finish it this coming Friday. 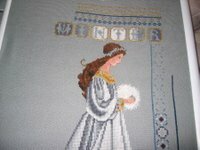 Saturday and Sunday, I focused most of my time on Celtic Winter. 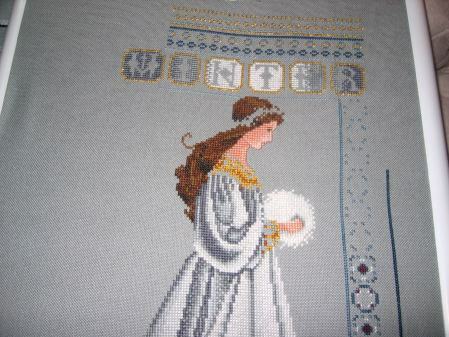 I finished all the cross stitching on the word “Winter” and on the bands across the top. Yay me!! 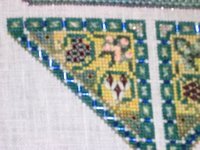 I hope to finish up the right hand border on Thursday night. 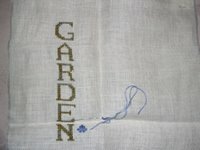 When I needed a quick break from CW, but didn’t want to give up on stitching, I pulled out the September Garden Kit that Cathy sent me. I really like it and can’t wait to get to more of the specialty stitches . Tonight, I get to spend a little time on Woodland FAiry and I also want to start basting the fabric for my Brightneedle online class as the first segment comes out on Wednesday and I want to stitch a bit on it at some point this week. « Here is my most recent progress on Woodland Fairy…. Lovely job on all of your stitching! I wonder if those red satin stitch flowers are bleeding hearts? They kind of look like it, though I’m used to seeing the “heart” of the flower a colour and the red part as white. 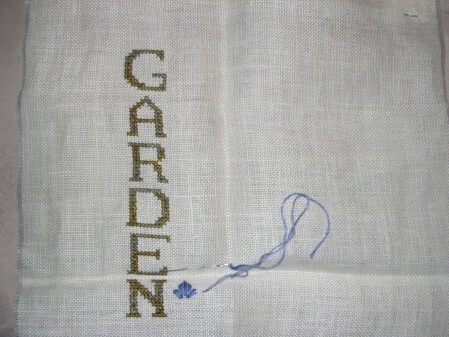 good progress on all your stitching! !